Wondering if we were close to any of the recent disaster areas in Indonesia? No to the Sumatra tsunami. Yes to Mt. 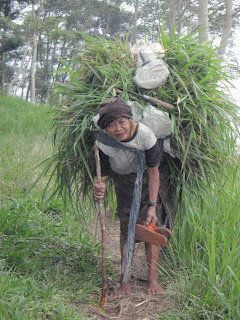 Merapi, where these pictures were taken. We visited the mountain twice in September, when we were in Solo, Java with Amy. Tom climbed to the summit in 1976. The mountain is about an hour from Solo – you can see it from the outskirts of town on a clear day. The car trip up the south slope took us by densely cultivated fields of tobacco, peanuts, tomatoes, papayas, chilis, thriving in the volcanic soil. The area was rural but heavily populated, no doubt due to the rich soil, and has been for a very long time. (Prambanan, a site of ancient temples, lies at the base of Merapi). There was a small village where the paved road up the mountain ended. It was cool and rainy and we enjoyed a cup of the local specialty, ginger coffee. We looked around the devastated area. The size of the river of mud that had scoured the area during the last eruption in 2006 was incomprehensible. You can’t say they weren’t prepared. There were warning sirens all over the place, dams, and a big concrete underground bunker. Our guide told us Merapi was one of the ten most active volcanoes in the world and the next eruption could come any time. The evergreen forest above the mudflows was steep and beautiful. There were a pair of orange flip-flops laying by a path into the woods. I wondered what they were doing there. 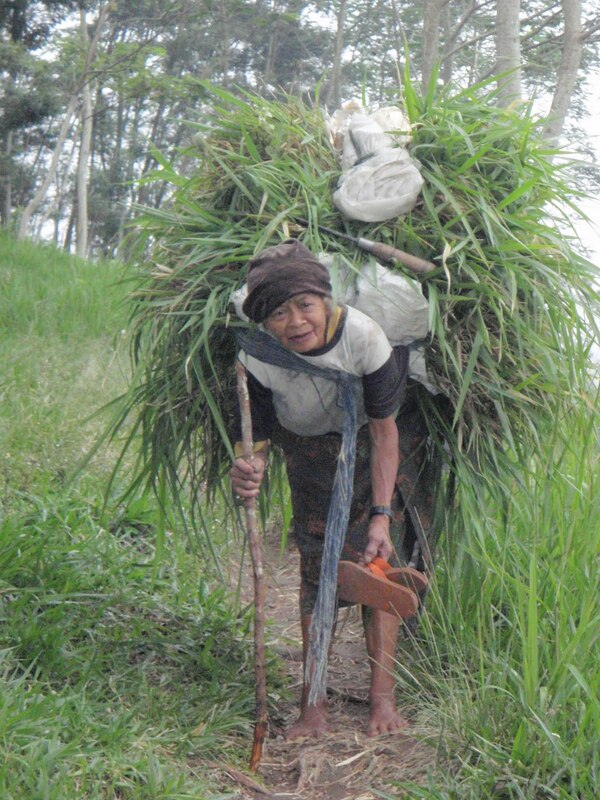 I first noticed their owner, the woman in the photo, when I heard a rustle – the bundle of grass she was carrying down the mountain to feed her livestock. I watched her descend slowly but surefootedly, barefoot. She was pleased to have her picture taken and excited to see herself in the display screen. She chortled with glee when I gave her a bunch of small change as a thank-you. I wondered then, amazed, what kind of a life has she led, an hour away from big cities? I wonder now, where is she? How is she doing? I love your pictures, we do wonder what their lives are like after we leave. We get such a short time to with the locals, but the memories last forever.